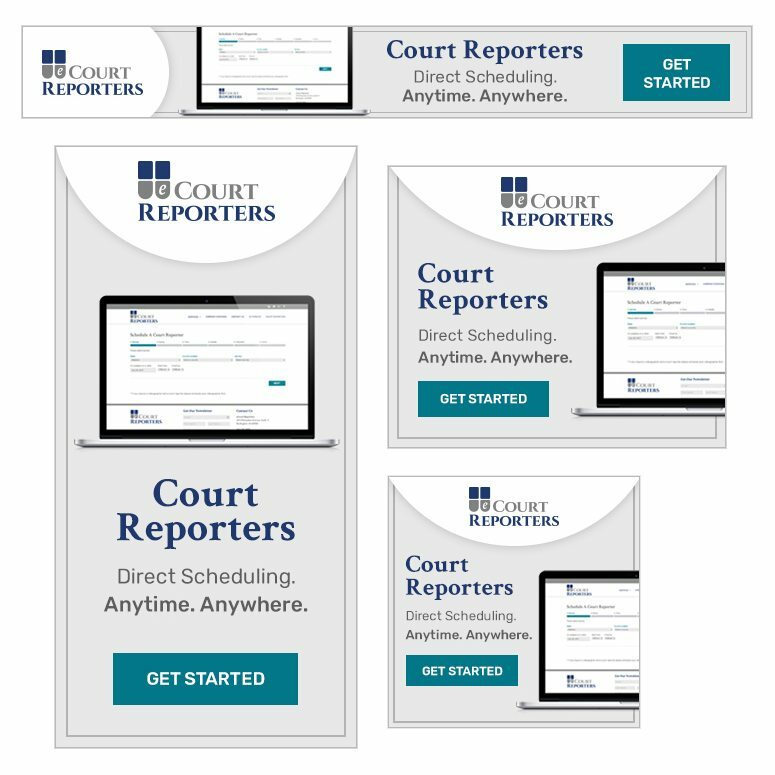 eCourt Reporters is designed for attorneys to directly schedule experienced freelance court reporters and videographers in any state across the country. 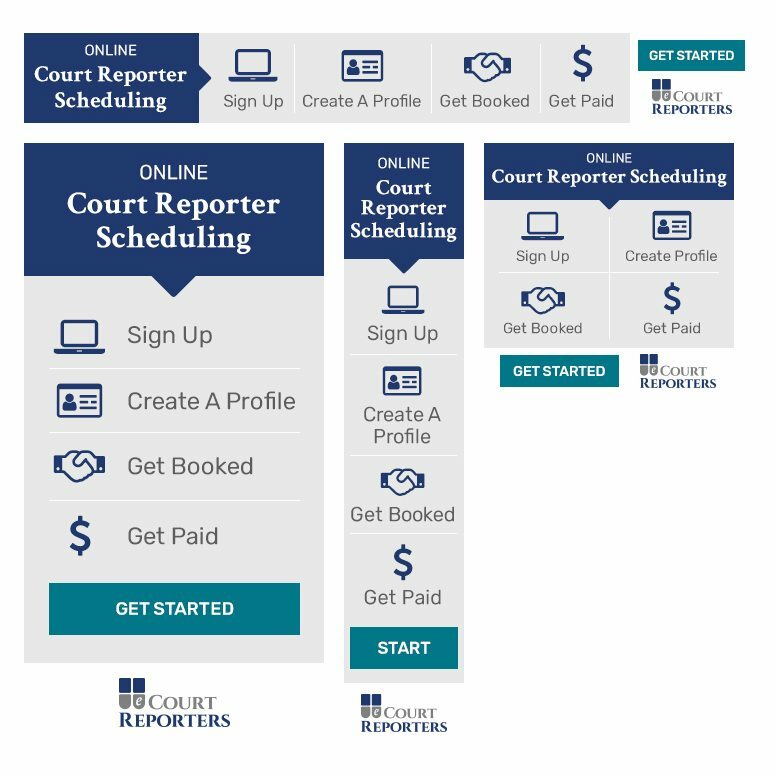 eCourt Reporters is designed for attorneys and schedulers to give easy access to court reporters anywhere in the United States. Certified freelance court reporters are listed and connected to attorneys based on qualifications, pricing and the locations they serve. Our strategy was to build out their services with a concentration on their value proposition being front and center because of the relative newness of the company and its services. 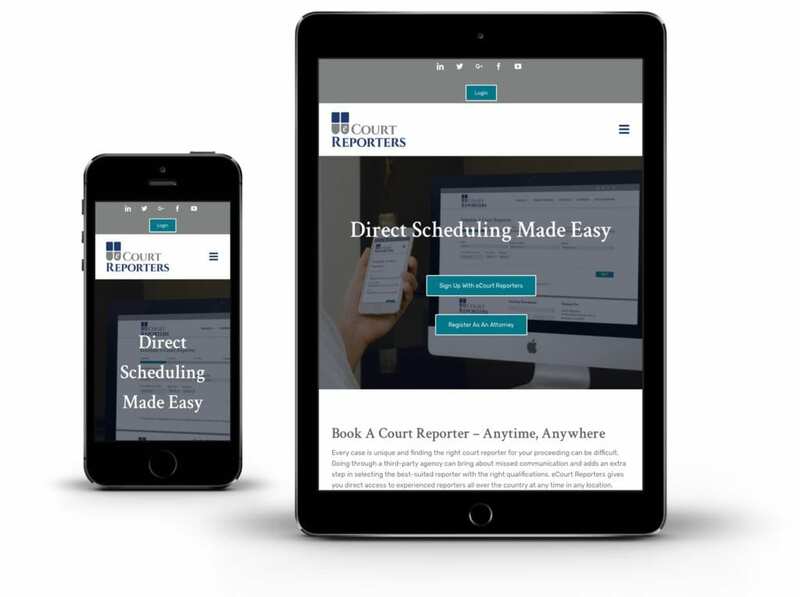 Being a fairly new company and industry idea, we wanted to make sure that eCourt Reporters would hit the ground running with their website.  We made sure enough information about their services was available to anyone who would see their website. Taking aim at the current industry standards, we focused on eCourt Reporters’ unique value proposition. We wanted it to be the first thing visitors would see so they would know what to expect. 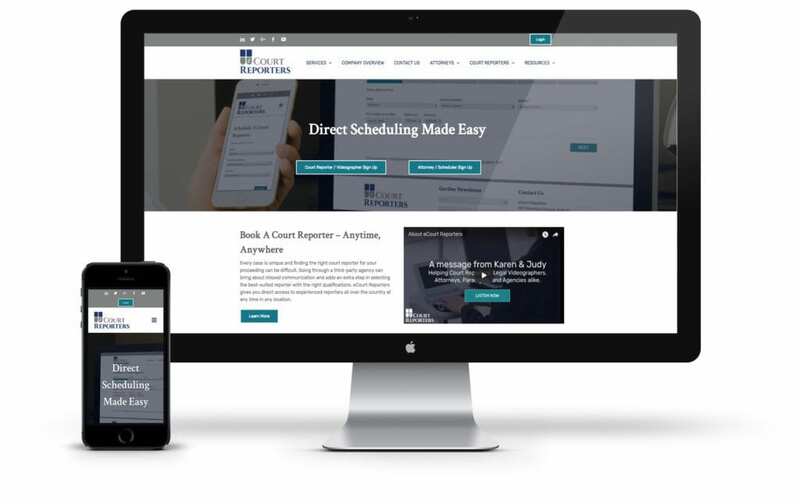 When you visit their homepage on any device, above the fold it reads “Direct Scheduling Made Easy.” Directly below the message, the user can sign up. 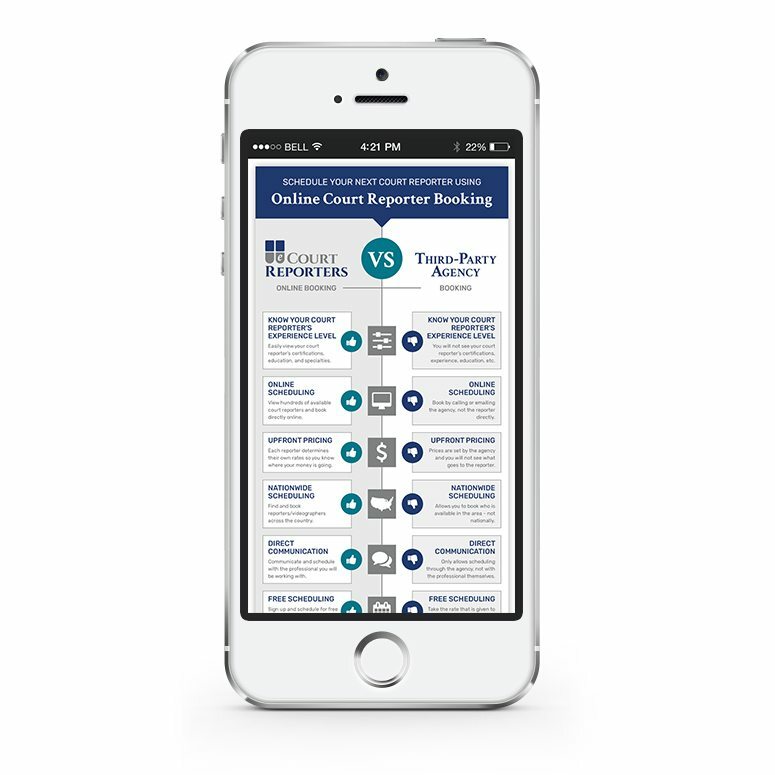 Below the fold is then dedicated to explaining the process and how eCourt Reporters delivers on its proposition. Building a brand through a website is something that takes experience, knowledge and some finesse. 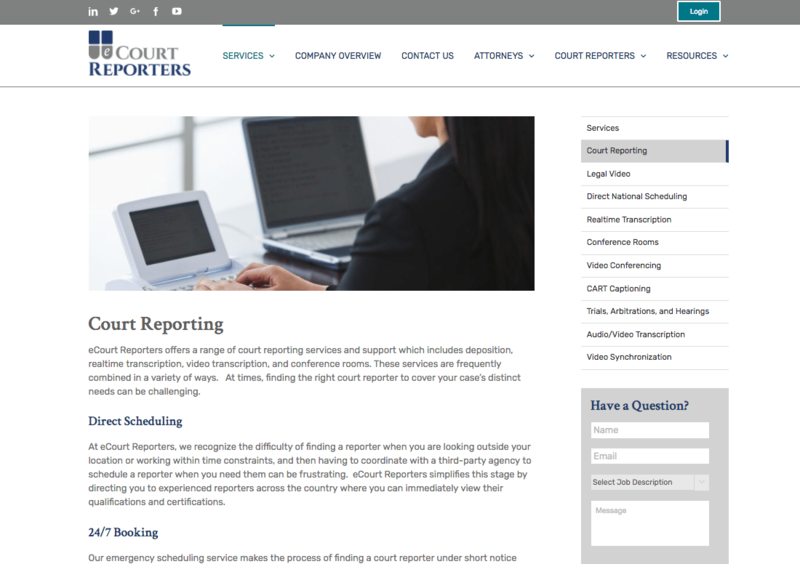 We displayed eCourt Reporters’ brand throughout their website and created a site that is built to bring in business. With eCourt Reporters being a brand new company, there was a need for business essentials, like stationary. Top Floor helped eCourt to meet those needs, by creating business cards and other print materials that were consistent with the brand standards Top Floor established throughout the website and logo design. 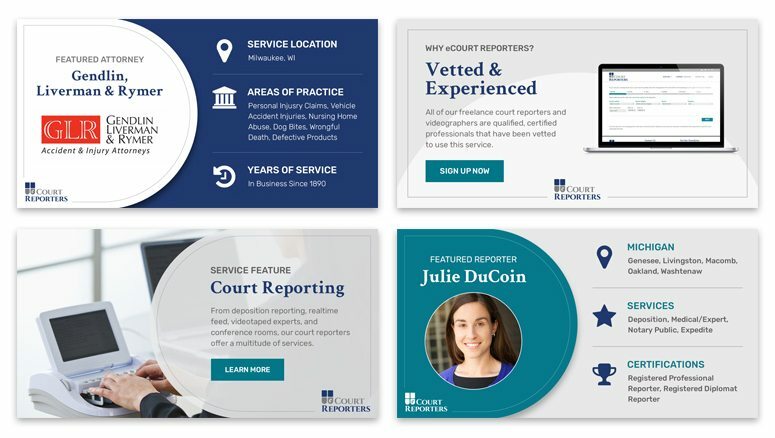 The focus of this infographic was differentiating eCourt Reporters from other booking agencies to emphasize the benefits eCourt offers above their competitors. When creating this infographic, Top Floor mirrored the look and feel of the new website. For example, the use of iconography that supports the message of the infographic and makes it more visually interesting. Top Floor showed eCourt Reporters four different logo concepts. Ultimately, the client chose this one. The shape within the logo resembles keys in a stenograph, which is a shorthand machine used by stenographers. This font was chosen to look very official and professional. However, the design incorporated a little fun with the ‘e’ playing off of the rounded shape of the key. Similarly, the colors chosen for the logo (gray and navy blue) are corporate and professional, but there is an added pop of color with the teal that is featured throughout the site. 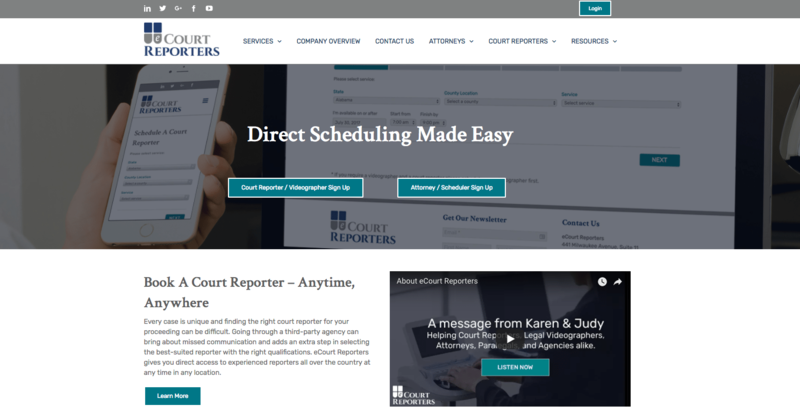 These ads focus on eCourt Reporters’ most important selling point – direct scheduling. The display of the booking process shows the simplicity and usability of the scheduling interface. 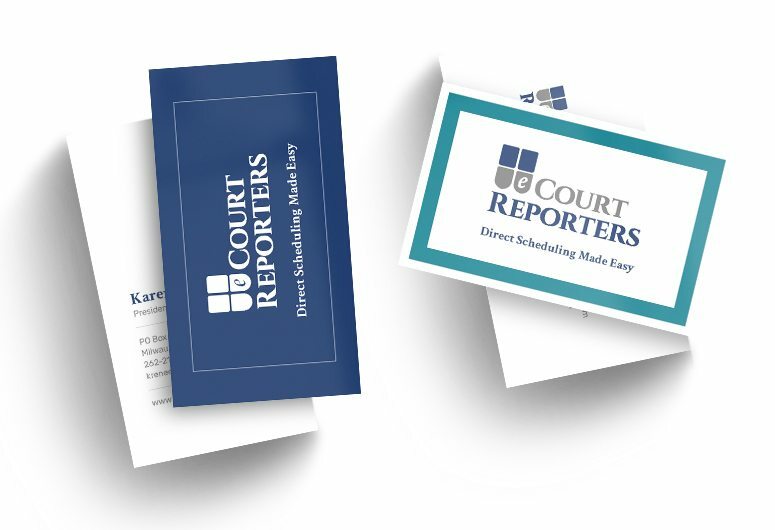 The design incorporates elements from logo, such as the rounded shape of the key, to reinforce eCourt Reporters’ brand. 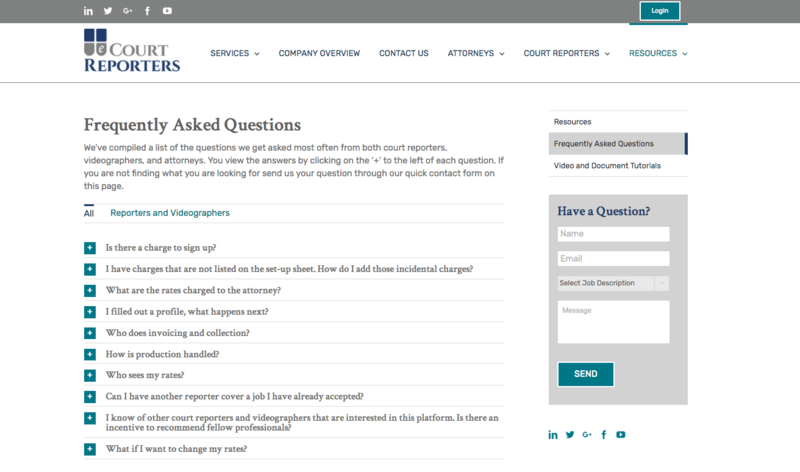 Top Floor created this set of ads to target freelancing court reporters. The iconography presents the steps in a streamlined way to show the simplicity of the sign up process. The final step, “Get Paid,” incentivizes the interest and response from professionals who would benefit from this type of workflow. 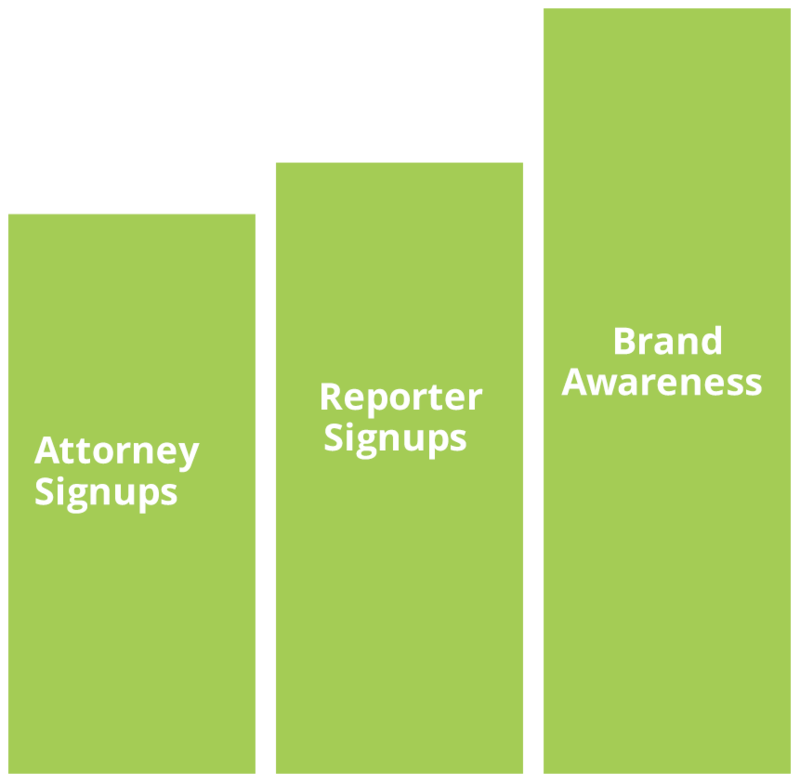 Top Floor promotes social posts for eCourt Reporters to support the unique selling points of their company. 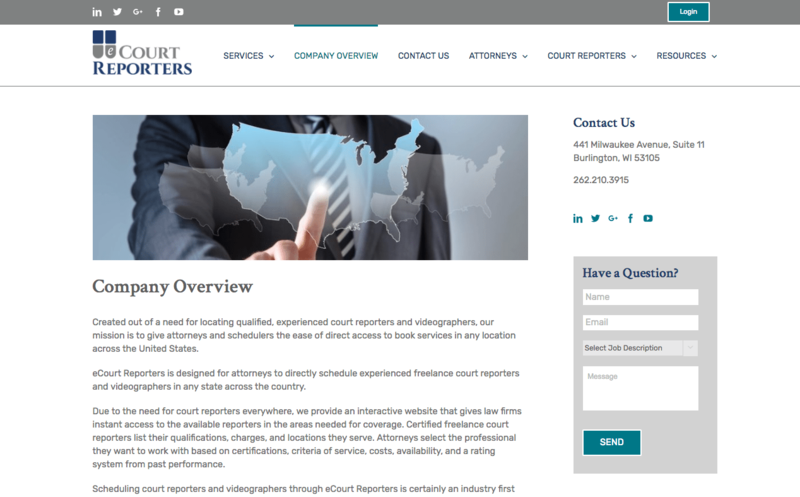 The graphics highlight different attorneys and reporters that are part of the eCourt Reporters’ roster. Additionally, the posts feature different services offerings to further support the benefits of the company. All of the graphics feature a rounded shape, resembling a stenograph key, and the icons add a little fun and visual interest throughout.